With the latest version of CasaTunes, and the Android and iOS Apps, we have made it even easier to share the music in one room with other rooms, and conversely, to join or listen to the music playing in another room, using the new Share Music and Join Room menu items. Now when you share the music playing in the currently selected room with one or more rooms, or join with another room, the participating rooms are now said to be “linked” together. In the example below, Jodi's Office, Master Bath, Master Bedroom and Living Room (the currently selected room), are now all linked. So, what does it mean when two or more rooms are linked together? It means two things. First, when you select to change the volume for a linked room, not only are you able to change the volume for the currently selected room, but you can also change the volume for each of the linked rooms. Secondly, if you change the source or player for a linked room, it changes the source or player for all linked rooms. It is conceptually similar to Room Groups, except these pseudo groups are created dynamically and on an ad hoc basis. You can quickly identify whether a room is linked by the presence of the “linked” icon in front of the room name (Living Room, in the example above). 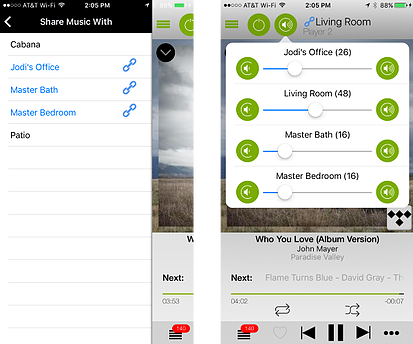 Share Music and Join Room are ideal for quickly and easily linking and controlling one or more rooms, but what if you want to move the music from Living Room to the Master Bedroom? Use the Move Music menu option to move playing music from the currently selected room to the new room. Once the music is moved to the new room, the original room is powered off.